E Ojiyi, E Dike, F Anolue, A Chukwulebe. Appraisal Of Caesarean Section At The Imo State University Teaching Hospital, Orlu, Southeastern Nigeria.. The Internet Journal of Gynecology and Obstetrics. 2012 Volume 16 Number 2. Background: There is a general aversion to caesarean section among Nigerian women. However, with increasing safety of the procedure and better enlightenment, more women are beginning to accept the procedure. To maintain this increasing acceptability, Caesarean section rate as well as its attendant morbidity and mortality must be reduced to the barest minimal levels. The aim of the study is to determine the rate and the complications associated with Caesarean section at the Imo State University Teaching Hospital, Orlu.Methods: A four-year descriptive study from June 2004 to May 2008 from the Obstetrics Department of Imo State University Teaching Hospital, Orlu was conducted. All pregnant women that delivered by Caesarean section was included. The data were analyzed using simple percentages, p-value and chi-square where necessary.Results: There were 363 (33.2%) mothers who underwent Caesarean sections out of 1094 deliveries in the unit during the period under review. Postoperative complications occurred in 52 patients (14.5%). The complications cut across all reproductive age groups and parity. The commonest complications encountered were wound infection (11.5%), postpartum haemorrhage (10.1%) and anaemia (6.4%). The mortality rate was 0.8%.Conclusion: The caesarean section rate of 33.2% and complication rate of 14.5% are still high even though they are less than the figures quoted for some environments. There is still need to reduce this rate to the barest minimum for us to be able to sustain the gains of the past. With improvements in the technique of Caesarean section, safer anaesthesia, newer and potent antibiotics and easy availability of blood transfusion services, Caesarean section is now safe. With more education and enlightenment, it is becoming more acceptable to our women.7,8 This will logically translate to increasing Caesarean section rates inmost Nigerian hospitals.3,7 It is important that this increasing acceptability be sustained by minimizing Caesarean section related morbidities and mortalities to the barest minimum as Caesarean section complications contribute significantly to maternal mortality3,7. This will also help prevent a reversal of the gains of the recent past. This descriptive retrospective study aims to determine the Caesarean section rate and its complications at the Imo State University Teaching Hospital from 1 st June 2004 to 31 st May 2008. The indications for carrying out a Caesarean section in our centre are also examined. It is essentially an audit report. The findings will form the basis for making recommendations towards reducing our Caesarean section rate to that recommended by the World Health Organization. It will also assist us in making recommendations towards reducing Caesarean section associated morbidities so that the procedure will become more acceptable to our women. This is a descriptive study. All patients who underwent Caesarean section at the Department of Obstetrics and Gynaecology of the Imo State University Teaching Hospital, Orlu between June 1, 2004 and May 31, 2008 were included in the study. Their case records were retrieved from the medical records department. Five patients were referred to the unit from nearby peripheral hospitals with complications of labour requiring Caesarean delivery. Two units of blood were grouped and cross-matched for all the patients prior to the surgery. Pre-operative as well as a 2 nd day post operative haemoglobin estimations were done for all the patients. All patients were prophylactically covered with ampicillin and cloxacillin combination, metronidazole and gentamicin for five days. All patients were followed up until they were discharged. General anaesthesia was used for all the patients. Information extracted from the case files included the age, parity, booking status, type of incision, indication for Caesarean section, number of previous sections, type of surgery(elective vs emergency), pre and post-operative haemoglobin levels, blood transfusion, post-operative antibiotics, duration of hospital stay and post-operative complications. Puerperal pyrexia was taken as a temperature of 38ºC or more in more than two occasions 6 hours apart after the first 24 hours post-operatively. Anaemia was taken as any statistically significant difference (p<0.05) between the pre and post-operative haemoglobin levels for any individual patient. The data obtained were analyzed using the WHO Epi-Info Version 6 statistical package. During the study period, 1094 deliveries were conducted in the Obstetrics department of the hospital. Three hundred and sixty-three of the deliveries were by Caesarean section giving a Caesarean section rate of 33.2%. Five patients with incomplete case records were excluded from the study. The remaining 358 case files were analyzed. Fifty-two (14.5%) of the 358 patients had Caesarean section related complications. 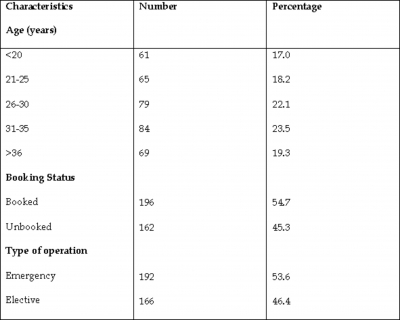 Table 1 depicts the age, booking status and the type of operation of the 358 patients who underwent Caesarean section. Only 196 (54.7%) of the patients were booked. One hundred and ninety-two (53.6%) of the patients had emergency caesarean section while 166 (46.4%) had elective section. 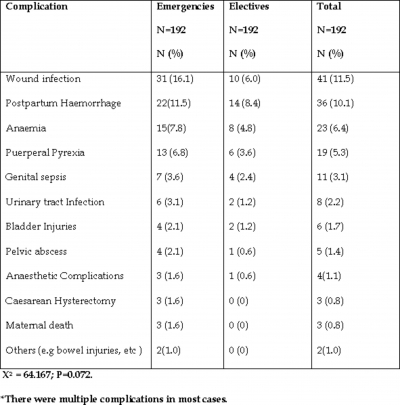 The difference between the post-operative complications was not statistically different between the elective and the emergency groups (χ2 = 64.164; P=0.072). 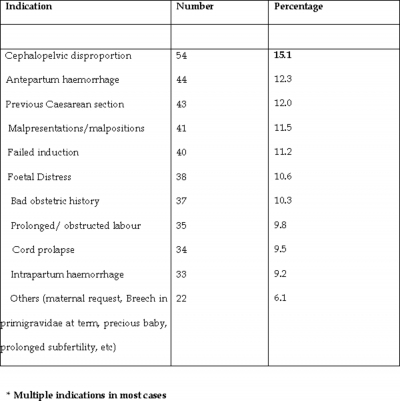 Table 2 shows the indications for Caesarean section in the 358 patients. The three commonest indications for Caesarean section in the patients were cephalopelvic disproportion (15.1%), antepartum haemorrhage (12.3%) and previous Caesarean section (12.0%). Table 3 shows the complications encountered in the 52 patients who had Caesarean section related morbidity and mortality. Wound infection (11.5%), post-partum haemorrhage (10.1%) and anaemia (6.4%) were the commonest complications encountered. The major contributors to the post-partum haemorrhage were uterine atony, placenta praevia, placental abruption, placenta accrete and extension of the uterine incisions into the broad ligament. Three patients (0.8%) had Caesarean hysterectomy for uncontrollable uterine bleeding. Four patients had anaesthetic complications, two had difficult intubation and the other two had the oesophagus intubated instead of the trachea. Three of the patients recovered after being placed on intermittent positive pressure ventilation for eight hours, the fourth died of respiratory failure after four days at the intensive care unit. There were three maternal deaths. Two occurred amongst the referred cases. The other occurred in a booked patient who had difficult intubation during an emergency Caesarean section for foetal distress and intrapartum haemorrhage. There was no death among the elective Caesarean section group. The average duration of hospitalization post-operatively was 7-10 days. Table1. Age, booking status of the patients and type of operation. A caesarean section complication rate of 14.5%in this study is very high considering the fact that the technique for the operation has been extensively refined and blood for transfusion is now safer and easily available. Besides, there is easy availability of modern and potent antibiotics. The complication rate is however comparable to the 15.6% reported in Lagos 3 and lower than the 44.4% reported in Maiduguri7. The operation rate of 33.2% is similarly comparable to the 31.6% reported in Lagos 3 and lower than the 43.6% reported in Maiduguri. 7Genuine efforts have to be made to further reduce these rates to levels in keeping with the WHO recommendation and to that comparable to what we have in the best of centres world-wide. There is the need to accurately date the pregnancy with ultrasound in cases of prolonged pregnancy before embarking on induction of labour. There is also the need to adequately monitor the foetus in labour with intermittent auscultation for ‘‘low-risk pregnancies’‘ and electronic foetal monitoring for ‘‘high-risk pregnancies’‘ because inappropriate monitoring increases the risk of interventions.2 Our centre currently lacks the facilities for electronic foetal monitoring and foetal scalp pH. Had they been available, the percentage of patients that were sectioned for the so called “foetal distress” might have been lower. Also fears about foetal macrosomia, adequate analgesia in labour and avoiding performing Caesarean section based on maternal request will all help to further reduce the risk of caesarean section in our environment. About 6.1% of the caesarean sections performed in this series were on account of miscellaneous indications including maternal request. There is need to respond to emergencies promptly which also involves more commitment and dedication to duty on the part of all concerned. Moreover the quality of service offered like improving on the level of monitoring during the operation and the use of meticulous surgical techniques must be improved upon. This will help reduce the rate of such complications like bladder and bowel injuries and anaesthetic complications. More than 71% of the patients with complications were done as emergency procedures. This is also the finding of other authors.3,7. This might be a reflection of the cadre of doctors who did these operations as most of the emergency operations were carried out by Resident Doctors. Most of the elective procedures were done by the consultant staff of the department. Also, in emergency situations, little attention is paid to detailed precautions to reduce complications prior to and during the procedure in an attempt to quickly deliver the baby to avert more serious foeto-maternal complications or death. With improved patient monitoring during Caesarean section, early signs of complications could easily be picked up and immediately remedied. The consultant staff of the hospital should also be encouraged to be more involved in emergency situations as a way or reducing the complication rate. Previous Caesarean section ranks very high amongst the indications for surgery in this series. This is also the observation of other authors. 1,2,4-7Attempts should be made to reduce the rate of primary Caesarean section, hence the need for Caesarean section in subsequent pregnancies, especially in indications such as foetal distress, prolonged subfertility, bad obstetric history, and “precious baby”. Induction and augmentation of labour should also be considered in patients with a previous Caesarean section scar. The progress of labour should be closely monitored in these situations so that Caesarean section could be reserved for strictly obstetric indications. In spite of the use of prophylactic antibiotics in all the patients, morbidities related to wound infection like puerperal pyrexia, genital sepsis and urinary tract infection were still very common. This was also the finding of Chama et al 5 in Maiduguri. Strict aseptic techniques should not be taken for granted during the procedure. The reason for the Caesarean section like in cases of failed induction of labour following a premature rupture of foetal membranes could also contribute to infection related morbidity. Fumigation of the theatre at least once a year will also help in bringing down the rate of infectious morbidity.8,9 This is not currently the practice in our centre. The significance of early referral of patients cannot be over-emphasized. The two patients that died amongst the referred group might have been saved had they been referred earlier. Even when they are referred early, poverty makes it almost impossible for some patients to fully benefit from the quality of care available in our tertiary health facilities. Efforts at reducing the present level of poverty in the country will help in addressing this problem. The Caesarean section mortality of 0.8% in this series is similar to the 1.0% reported by Chama et al. ,5 but lower than the 4% reported by Megafu et al. 10 The importance of early referral has been stressed. Our centre lacks consultant anaesthetists at the moment. To minimize anaesthesia related complications during Caesarean section, we recommend that enough consultant anaesthetics should be employed. More equipment for anaesthetic monitoring during Caesarean section will also go a long way in addressing this problem. A caesarean section rate of 33.2% and related morbidity of 14.5% and mortality of 0.8% in our environment are still high. To reduce this rate, the rate of primary Caesarean sections must be reduced by basing the decision to carry out a Caesarean operation on sound indications. All patients undergoing Caesarean section, irrespective of the indication, should be well prepared pre and intra-operatively. Strict aseptic procedure and meticulous surgical technique should be employed in all cases. The consultant staff of the obstetric department should also get more involved in the procedure, especially the emergency cases. The theatre should be fumigated from time to time. Swabs from the obstetrics theatre should be taken for culture and sensitivity so that antibiotic prescription pattern could be reviewed from time to time. Blood should also be made available for all Caesarean operations irrespective of the indication. Consultant Anaesthetist should be employed as a matter of urgency to reduce anaesthesia related complications. Their availability will also encourage the use of spinal anaesthesia in our centre which is the recommended anaesthesia for caesarean section worldwide. 1. Thomas J, Paranjothy S. Royal College of Obstetrics and Gynaecologists Clinical Effectiveness Support Unit. National Sentinel Caesarean Section Audit London: RCCOG Press, 2001. 2. Hayman R. Caesarean section. In: Lueslly DM, Baker PN (eds). Obstetrics and Gynaecology: An evidence- based text for MRCOG, London: Oxford University Press, 2004; 1: 381-390. 3. Ezechi OC, Nwokoro CA, Kalu BK, Njokamma FO, Okeke GC. Caesarean morbidity in a private hospital in Lagos, Nigeria. Trop J Obstet Gynaecol 2002; 19: 97-100. 4. Adeleye JA. Primary elective caesarean section in Ibadan, Nigeria. Int Surg 1977; 62: 97-99. 5. Lawson JB. Obstructed labour. In: Lawson JB, Stewart DB, eds. Obstetrics and Gynaecology in the Tropics and Developing Countries. London: Edward Arnold Ltd, 1967: 172- 202. 7. Charma CM, El-Nafaty AU, Idrisa A. Caesarean morbidity and mortality at Maiduguri, Nigeria. J Obstet Gynaecol 2000; 20: 45- 48. 8. Ojo VA, Okwerekwu FO. A critical analysis of the rates and indications for caesarean section in a developing country. Asia- Oceanic J Obstet Gynaecol 1988; 14: 185- 193. 9. Onwudiegwu U, Makinde ON, Ezechi OC, Adeyemi A. Decision-caesarean section in a Nigerian University Teaching Hospital: Implications for maternal morbidity and mortality. J Obstet Gynaecol 1999; 19: 30-33. 10. Gall SA Jr, Gall SA. Diagnosis and management of post caesarean wound complications. In: Phelean MK, Clark PS,eds. Caesarean delivery. New York: Elsevier, 1988: 388-402. 11. Creighton SM, Pearce JM, Stanton SI. Complications of caesarean section. In: Studd J, ed. Progress in Obstetrics and Gynaecology. London: Churchill Livingstone, 1991; 9: 163-176. 12. Megafu U, Nweke PC. Maternal mortality from caesarean section. Trop J Obstet Gynaecol 1991; 1:1-4.